UPDATED, 15 Dec 2012: Today I received a considered response from David O’Brien, GM of Customer Engagement at Old Mutual. I’ve added it below. Thanks, too, to Ursula van der Westhuizen at Old Mutual for getting in touch about it. I’m an Old Mutual client – I have a retirement annuity with them. Today I received from them the crappiest calendar I have ever seen. Is it a Christmas gift? It’s not even pretending to be one. A gift would be something you might want to keep. An advert? It’s a pretty awful advert. And it certainly won’t do what the cover letter hopes it will: “May this calendar remind you every day that as an Old Mutual customer you can count our advice and full support as you strive to achieve your lifetime goals.” Full support? Your customer support is about as utterly ordinary as anyone else’s. Advice? From the wise guys that produced this thing? Why am I so offended? Because in South Africa today, corporate waste is an insult. 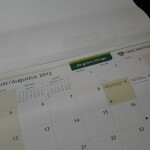 The calendar is an affront to anyone who cares about education, health or the environment. For the price of printing and distributing these calendars, every school in the country could have received a dozen educational posters, or a book for a library, or nurses could have received training materials or personal-success literature. At the very least, not producing this wasteful thing would have saved us all the environmental costs of printing and shipping them. Mine’s going straight into the recycling, where it may do some good. I have nicer things to put on my walls, as I’m sure do most Old Mutual clients. Next time, I want to get an email saying they’ve spent the millions this would have cost on something South Africa actually needs. Many thanks for the feedback, which we always welcome. 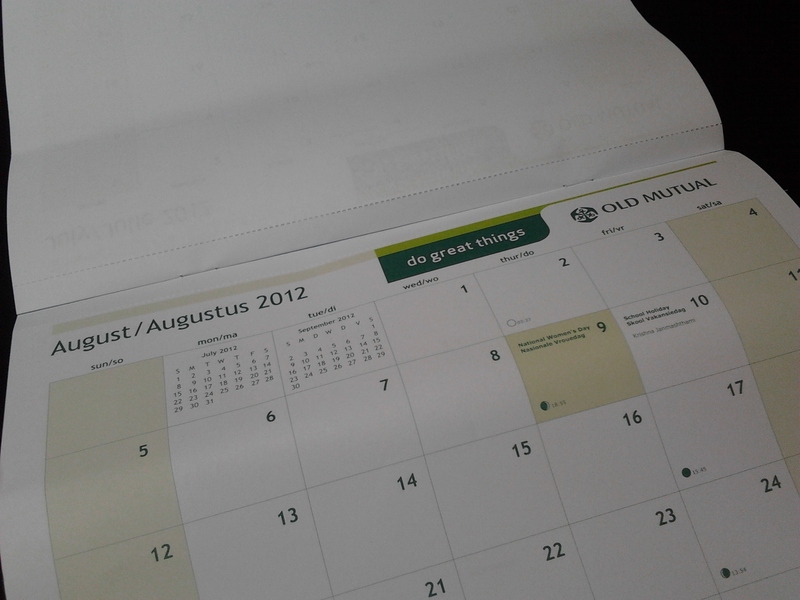 We’re sorry that you did not enjoy the Old Mutual calendar. Our calendar is much loved by the many people who have received one over many years. It has a simple format which makes it extremely functional. This year, we have distributed thousands of calendars and the overwhelming response to the calendar from our customers have been very positive. 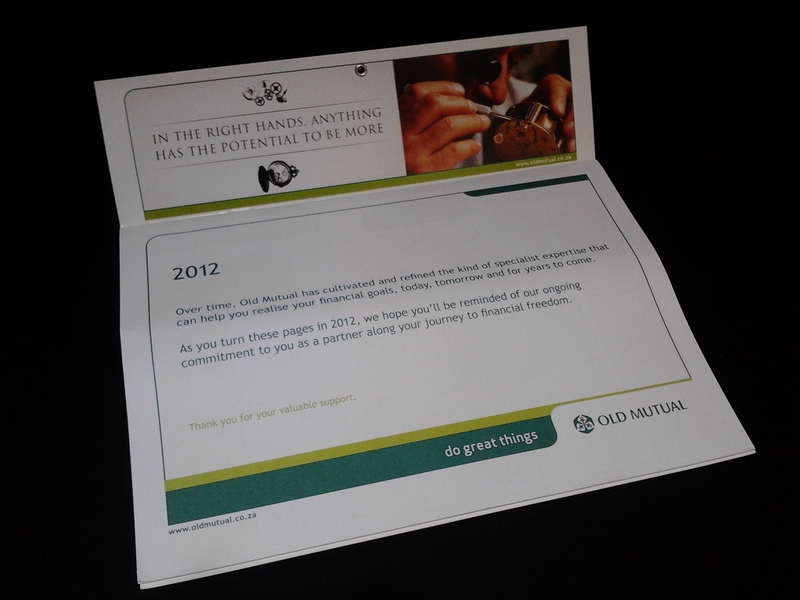 Old Mutual does not subscribe to corporate waste. The recycling of our waste paper is a key support stream for the Oasis School for the disabled in Cape Town, creating both income and employment. 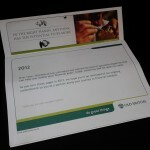 This calendar is part of an engagement program which has converted millions of printed pages into e-mails through the course of 2011. I am delighted to note that we correspond with yourself via e-mail. We have also increased registered users of our website by 40% through communication. I also want to point out that we have planted a sustainable olive grove on behalf of our customers, to benefit a community in years to come. I am very keen to hear about your experience of our ordinary customer support. This year we have implemented a customer feedback survey on the majority of touch points so that we can hear firsthand about the areas that we need to improve on. We were the highest scoring long term insurance company in the Ask Afrika Orange Index service study for the 4th year running. So – while we believe we are working hard in the right direction – we are always open to listen. If you do not wish to use your calendar, I am happy if you’ll return it to me for recycling. Furthermore, I will also honour your wish to remove your name from our distribution list for future purposes. I really appreciate this reply, and the work Old Mutual does for social and environmental impact. That said, I still believe in this day and age sending a printed calendar to every client is not a great idea, even if you are receiving positive responses to it from some of them. (I.e. a positive response doesn’t mean what you’re doing is right.) But these are opinions, not data-driven arguments. If we’re all engaged in the steady, tricky process of figuring out the best way to grow businesses and do good at the same time, and as long as these things are thought through carefully beforehand, we’re all on the right track. Some people will always need to expose a blame on something even if there is nothing to be blamed. You are right Old Mutual. People who blame will always be there. Some will blame Old Mutual in this instance just because they want to fulfill their ego, may be one was dissatisfied with something else at Old Mutual or whatever. If the majority of clients are satisfied with what you are doing Old Mutual, please do not bother with those who want to let you down or hijack your direction.